Carcans is the name given to a group of places at the southern end of the large lake (the 'Lac d'Hourtin et de Carcans') a few kilometres north of Lacanau Ocean on the Medoc peninsula. These places include Carcans Plage (the Atlantic sea resort), Carcans itself (a traditional town a few kilometres inland from the coast) and Maubuisson, a small town and resort at the southern edge of the lake. It is the Atlantic beach, which is sandy and several kilometres long, that is the principal attraction for visitors here to Carcans. 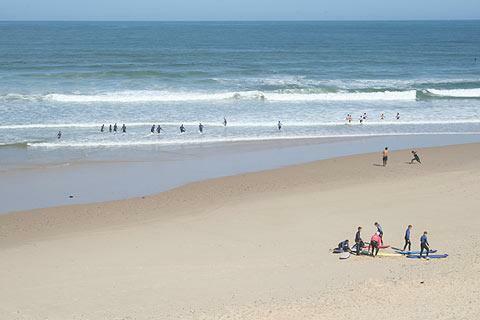 It is a very high quality beach backed by substantial sand dunes and popular with surfers. Carcans is one of our favourite beaches along this stretch of coast. Carcans Plage resort, clustered just behind the beach, is a typical 'holiday resort', pleasant for a break from the beach and with cafes and shops all geared to tourism but no building or monuments of historical interest. France This Way comment: although the beach is very good here, if you are planning a visit to Carcans you should be aware that it is much quieter here and has less facilities than at Lacanau Ocean a few kilometres to the south, especially outside high season. Maubuisson, just a short distance inland from the coast, is also worth passing through. There is a road that follows along the coast of the lake for a couple of kilometres and has nice views out across the lake. 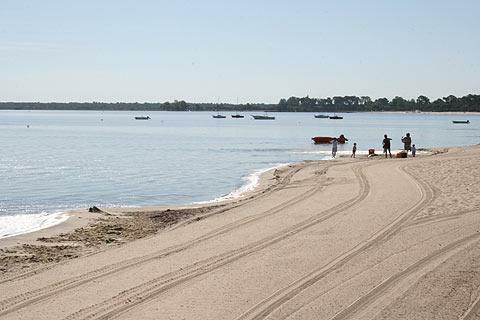 In the 'town' itself there is a small sandy lake beach, popular with children who find the Atlantic waves overpowering. The town of Carcans itself, slightly further east of the lake, has a church and basic facilities. A sign at Carcans explains that the forests and dunes were created 150 years ago to reclaim the coast from the wind and insects, and that the dunes were then planted to ensure their stability. Bear this in mind as you look around the Atlantic coast in these parts - both the forest and the dunes are very substantial in size and creating and planting them in the 19th century must have been an exceptional challenge! 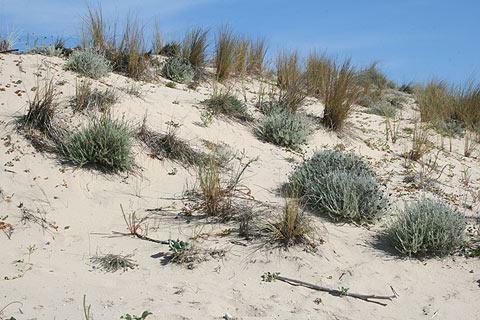 As a result of the need to protect the fragile environment visitors are not permitted access to some parts of the dunes.